I had placed a request for this book a while back, just after I finished the first book in the series. Now I'm faced with that awful time of waiting for the third and final book to come out this fall. It's never to late to check out the 2015 PopSugar Reading Challenge. Let me know if you're in it - we've also got a Facebook group where we talk about it, discuss what we've read, and suggest books to fit all the different categories. 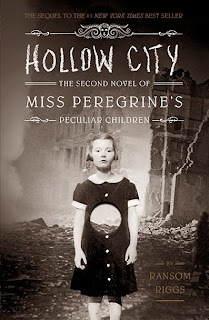 I read Hollow City by Ransom Riggs as my 'book with non-human characters.' While I probably enjoyed the first book in the trilogy (Miss Peregrine's Home for Peculiar Children) a little more, I think that was primarily because the first book introduced the whole concept, which made it fascinating in a new way. Hollow City covers the peculiar children escaping from the island that used to be their home. They have several missions to accomplish: to help their previous 'mother-figure' back to normalcy, of sorts; to find another loop - the environment they need to continue surviving - where they can live going forward; and to stay free from the wights who want to capture them for the hollowgasts - their mortal enemies whose only goal is to capture the peculiar children and essentially eat their souls. I can't wait for the third book, Library of Souls, to come out near the end of September!! This looks interesting! Is it kind of creepy too? I haven't read a novel in so long, mostly sticking to bio's and how to books lately. I finished the first one and could not wait to start the second. It's been on my kindle for a year and I haven't finished it. Please tell me it picks up. Sounds like it could be an interesting book, but it does sound kind of creepy. Not sure I could handle the creepy part of it. The PopSugar Reading challenge sounds like a great way to broaden your reading horizons. I don't have much time to read, so I don't know that I'd be able to get it done. I'm not sure I'd like these books though. I'm not much for the fantasy/horror genre. Looks interesting...I totally understand the struggle of waiting for the next book in a series to come out! !